Photo by Rachel Webster. Concordia Art Professor Heidi Goldberg presenting her work to Jon and Tessa Leiseth. The show is called 'Livets dans (The Dance of Life)', and it encompasses the essences of nature in southeastern North Dakota. The stark, mysterious, grassland hills of southeastern North Dakota have taken over Concordia’s Cyrus M. Running Gallery. The gallery’s walls have been pushed away to make room for nature, which has come bringing seasons, storms and tales of the land. Art Professor Heidi Goldberg’s show Livets dans (The Dance of Life) brought this landscape to the gallery using a multimedia approach that included printmaking, photography, drawing, oil painting, watercolor and paper weaving. Goldberg has brought these rural hills home to Concordia, her collages beckoning viewers to reflection. “Nature is almost always the launching point for me,” Goldberg said. Goldberg said she first fell in love with southeastern North Dakota after taking family trips there. She was inspired by its openness and mystery, and she wanted to reflect these qualities in her collages by giving viewers a sense of the region’s appearance and also by telling the stories of the environment and the people who have inhabited it. “There are remnants on the land of the people that have been there, and I reference that too,” Goldberg said. Indeed, in many of collection’s pieces, there are shadowy drawings of human artifacts hinting at the individuals who have populated the area. A piece in the skyway, a photograph printed on muslin, shows the stone outline of a former homestead and prompts the viewer to ponder the identities’ and lives of those pioneers. Also significant to the collection are the relationships Goldberg draws between the heavens and the earth. Each piece is divided into two sections, a land section and a sky section. The land, Goldberg said, represents the tangible, and the sky represents dreams. These two sections remain separate in the pieces, but patterns, drawings and paper weavings overlap between them, creating invisible bridges. “I think the really pleasurable thing about this show is how continuous it is,” gallery manager Heather Hardester said. She feels that the “walls dissolve” when she stands alone in the gallery and examines the work. “There’s a real sense of tranquility,” Hardester said. Also important to Goldberg was depicting the rotation of seasons and times of day and showing how these changes impact the overall feeling and appearance of the landscape. “What I’m doing with this exhibition is thinking about the cycles of life and the cycles of nature,” Goldberg said. Hardester thought this emphasis on cycles prompted deeper examination of the natural world. “I think it really speaks to how powerful and ever-changing the world is around us,” she said. Goldberg said that bringing audiences to a deeper awareness of nature is a significant part of her message in this collection. Place is an important part of her inspiration as an artist, and she wants others to be aware of the impact their surroundings have on their own lives. “The important thing for me is that people be brought into an awareness of spaces that are important for them,” Goldberg said. 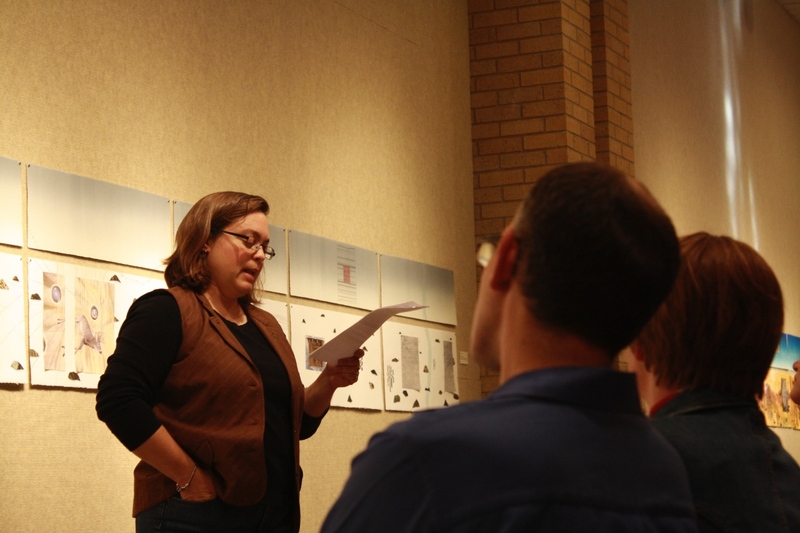 Senior Karina Grimaldi was at Goldberg’s gallery talk last Tuesday. Grimaldi is a student of Goldberg’s and was impressed by the aesthetics of the display. Grimaldi said she felt that she was really in the place when she viewed Goldberg’s work and was impressed by her professor’s passion for the land and attention to detail. “It’s a fascinating perspective on a landscape that is really rich but would otherwise probably go unnoticed,” Grimaldi said. As for Goldberg, it’s perspectives like Grimaldi’s that count the most. Goldberg’s show, Livets dans (The Dance of Life) will be in the Cyrus M. Running Gallery from Oct. 4 to Oct. 30. The gallery is open from 9 a.m. to 4:30 p.m. on weekdays and 1 to 4 p.m. on Saturdays and Sundays.